Win a 3 month Digital Theatre Subscription! Digital Theatre has officially announced the launch of an online subscription platform that brings the best of live theatre, ballet, opera and classical concerts, to your own screen. Performances can be streamed anytime, anywhere, and to any device. 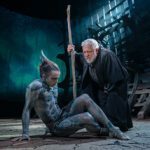 Subscribers will have access to over 65 productions, including: Simon Russell Beale in The Tempest, Antony Sher in King Lear, Zoë Wanamaker and David Suchet in All My Sons; Richard Armitage in The Crucible and David Tennant & Catherine Tate in Much Ado About Nothing, with a further 50 curated productions from some of the world’s leading producers, all scheduled for release over the next six months. The Tempest, Much About Nothing and King Lear were all written by which famous playwright? Email your answer to theatrefullstop@gmail.com by Friday 2nd February 2018, 11:59pm.